Anyone going to Big Sur? Having played Sundance last winter, and the San Francisco Film Festival this past spring, Big Sur, the new film based on the eponymous novel from Jack Kerouac opened in theaters across the country this weekend. Director Michael Polish wrote the adaptation which stars Jean-Marc Barr, Kate Bosworth, Josh Lucas, Rhada Mitchell and Anthony Edwards. More about who's who after we catch up on the book. 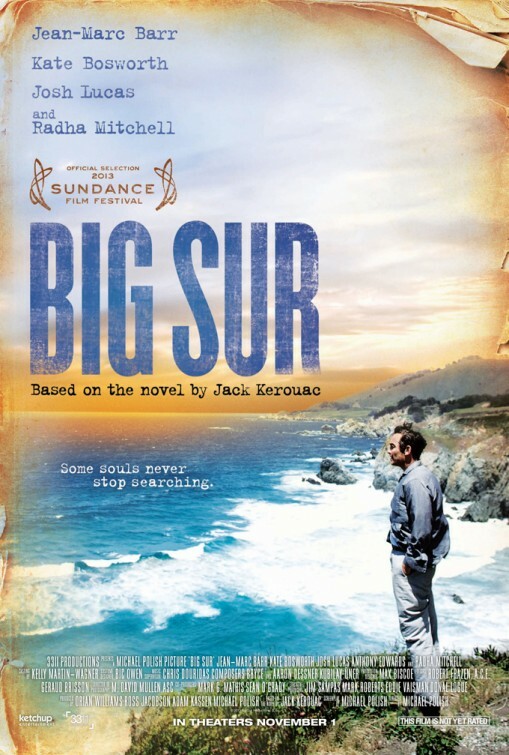 "Big Sur is a 1962 novel by Jack Kerouac. It recounts the events surrounding Kerouac's (here known by the name of his fictional alter-ego Jack Duluoz) three brief sojourns to a cabin in Bixby Canyon, Big Sur, owned by Kerouac's friend and Beat poet Lawrence Ferlinghetti. The novel departs from Kerouac's previous fictionalized autobiographical series in that the character Duluoz is shown as a popular, published author; Kerouac's previous novels are restricted to depicting Kerouac's days as a bohemian traveller. Across Duluoz's subsequent trips to Big Sur and interleaved lifestyle in San Francisco, he drunkenly embarrasses Cody by introducing Billie to Cody's wife, cannot emotionally provide for the increasingly demanding Billie, and finds himself increasingly unable to integrate into suburban life. Duluoz's inner turmoil culminates in his nervous breakdown during his third journey to Big Sur. "Some souls never stop searching." Sounds like the novel is thinly disguised memoir; judging from the trailer, the filmmakers have decided to play it as bio. The cast includes Jean-Marc Barr (Jack Kerouac), Josh Lucas (Neal Cassady), Kate Bosworth (Billy, Cassady's mistress) Rhada Mitchell (Carolyn Cassady) and Anthony Edwards (Ferlinghetti). "Something good will come out of all things yet and it will be golden and eternal"
What do you think? Will you be checking out Big Sur out this weekend?